Packet Pickup: Packet pickup FOR RUNNERS ONLY will be available January 7th through January 11th at Runner's Edge, 3195 N. Federal Hwy., Boca Raton, FL 33431. Phone 561-361-1950. 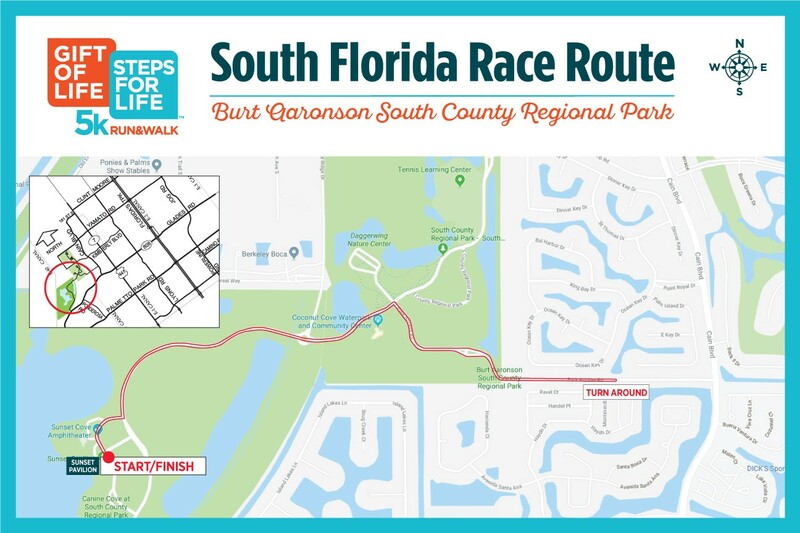 We also offer packet pickup for all participants from Monday, January 7th through Friday, January 11th between the hours of 9am and 4pm at the Gift of Life office - 800 Yamato Road, Suite 101, Boca Raton, FL 33431. For those that cannot pick up packets in advance, packet pickup is available day of event starting at 7:30am at the Registration Tent. Event Festivities: A key moment of our event will be the first introduction of a bone marrow recipient to their lifesaving donor. All contact for the first year after a transplant must be anonymous, so it is always a joyful, exciting moment when the two are able to meet in person for the first time! Music, refreshments, and more. Post race we are hosting an awards ceremony for the top runners. Children: The Superhero Sprint will be held at 9:00am before the 5K. All children ages 6 and under are encouraged to join and costumes are welcome. Sprinters will receive a free Gift of Life cape and a Superhero Sprint finisher medal. For safety, please wear sneakers. Day care is not available at this event. Restrooms: Will be available for use with handicap availability. Signage will point the way! Water Stops: Water will be provided throughout the event and at two water stops on the course. Refreshments: Continental breakfast and coffee will be served. Kosher options are available. Bag Check: Bag and coat check are not available.